Catch Up® Literacy review session - running as a webinar this July! 12th March 2015 - Catch Up® Literacy review session - running as a webinar this July! We are delighted to announce that this Summer Term, we will be running our Catch Up® Literacy ‘Review and next steps’ session as a webinar. The review session happens around six months after Catch Up® training, and is designed to review delivery of Catch Up®, and give further guidance for all trained members of staff delivering and managing Catch Up®. To give you more opportunity to attend a review session, we are running it as a webinar this July – trainees can follow a simple log in process to join us from their own computer, where they will be led by trainer Dee Reid and be able to ‘talk’ to other trainees via a type-in chat window. 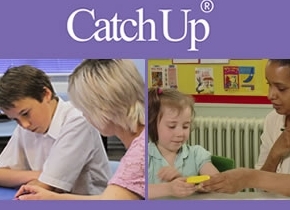 If you attended Catch Up® Literacy training over six months ago and are yet to have your review session, sign up now to join the webinar, taking place on 16th July 2015 at 13.00-15.00. Email us to join. The session is available for all trainees who have attended the three half-days Catch Up® Literacy training, and is included in the price of your original training, so there is no further charge. The review session webinar follows the huge success we have had with offering our Catch Up® information session as a webinar – over 400 of you have joined our introductory webinar since we started running it every month in December 2013!